I coach men, women, and teens who feel stuck in their personal, professional, and spiritual lives. If you need someone to help you unlock your potential and move forward, don't wait-contact me today! Every story has a hero. The person who moves the ball forward, the one who somehow finds a way to do the impossible, that character who makes everyone stand back and say, "Wow!" YOU can be the hero in the story of your life! But even heroes need a little help sometimes. You just need the other character critical to your story - a guide to get you to the heights you know you can reach. I can be that guide. With over 15 years of experience in speaking, teaching, leadership development, and coaching, as well as the decades of experience and training of the John Maxwell Team behind me, I have the tools and passion to help get you unstuck, move past that roadblock, or just unleash the ideas and potential that are already within you. Under the training of renowned coach Christian Simpson with the Maxwell Team, I'll use the truly insightful TGOROW method to help you find solutions to what is holding you back, or maybe just help you "sharpen the saw" to improve your life! During my educational studies, I earned a Bachelor of Arts in Biblical Studies with Minor in Speech Communication from Ouachita Baptist University and a Master’s Degree in Education from Southwestern Seminary in Fort Worth, TX. In order to work my way through school, I served in the retail, sales, and non-profit arenas, so I understand corporate culture. Additionally, I have 15 years of being on staff in local churches and experience in curriculum writing, public speaking, campaign launches. 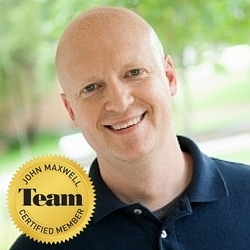 In 2015, I became a certified Speaker/Trainer/Coach with the John Maxwell Team, bringing time-tested practices and world-renowned experience to client engagements. Currently, I live in North Texas with my incredible wife and our four children. When not working with churches or parenting, I enjoys movies and college sports. Originally, I am from Arkansas, and I bleed Razorback red. If you're ready to find out how you can grow personally, professionally, or spiritually, contact me today for a free intake session! Are you making this common-but-critical mistake when trying to make life-change? Inspiration is always better than motivation!